"You’ll see couples in coffee shops who’ve been together 10-15 years both sat with their heads down, operating their devices. We need to give people their head up again. The ability to keep social interaction with the people that they’re physically with. That means a better ability to use the devices single-handed and them requiring less of our attention for peripheral interactions. Notifications, for example, could be much improved so they require much less from us. These remarks were made about MeeGo in the beginning of December last year, and fast forward six months and change, we have the Nokia N9 as a tangible example of the ideas above. We didn't pay attention at the time when he said Nokia likes what Microsoft has done with Windows Phone 7 in terms of how unobtrusive the UI of the mobile OS is, and will bring similar features to MeeGo. We thought Nokia will take a similar approach, but not bet its future on WP7. It's all in the history books now, but in the meantime you can watch an official video below about the making of the Nokia N9. The polycarbonate unibody desing makes it durable yet light, and since it's not metal, if you scratch it, it will still be the same color underneath. Then come the tapered edges, which, according to Marko Ahtisaari, need "expensive robots" to be manufactured, but give the Nokia N9 that distinctive design edge that so many smartphones need these days, in addition to the black, cyab and magenta colors it is available in. “The body flows seamlessly into the screen. The UI just floats on the surface of the product.”, he said. We can't agree more that this buttonless design is the way to go in any future smartphone - it gives you a 3.9" display in roughly the same footprint the iPhone 4 houses a 3.5" screen, with a lot of space dedicated to the home button. We've heard rumors that Apple is getting rid of it in next year's edition, but the Nokia N9 will stay as the first completely buttonless touchscreen-only phone in the front. Pressing a button to get to the homescreen has been replaced with just swiping the current app away. As Nokia's UI chief puts it - in a doll house, you don't need to always enter through the front door to get to different rooms. Hopefully this new seamless interface can grab consumers' attention enough, since there will barely be an app ecosystem around it, except for a few efforts in the Ovi Store, which very soon will just be Nokia Store and merge with the Windows Phone Marketplace. 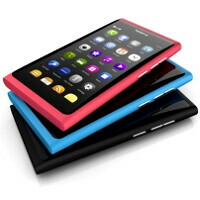 The Nokia N9 will be handed to developers right away, a source close to the company has clarified, and we should see wider availability within a month, which is very welcome. Knowing Nokia's flagship devices, it might not be cheap, but apparently that should be the price to pay if you want to be unique. Now have a look at Marko Ahtisaari's official presentation of the Nokia N9 design story below. What? N900 was the FIRST device with no buttons in the front. I'm looking at one right now and yes, there are no buttons on the front. http://maemo.nokia.com/ for a device image, or look it up on Amazon. "first completely buttonless touchscreen-only phone" The n900 has a key-board and thus isn't a buttonless touchscreen-only phone.